Sir James Bevan, Chief Executive Officer was among a delegation of senior managers from the Environment Agency who paid a visit to the site where Team Van Oord has commenced work on a scheme to provide better protection from flooding for the residents of Shoreham-by-Sea. The party was there to witness a training exercise taking place at Environment Agency sites across the country, including Shoreham. Environment Agency teams are training with new temporary flood barriers, pumps, vehicles, and drones as part of Exercise Certus, which reached its climax on Wednesday 12 October. The exercise, which involved around 1,000 staff, was designed to ensure that the Environment Agency is ready to respond to future flooding following the Government’s National Flood Resilience Review (NFRR). At Shoreham-by-Sea there was a series of ‘live’ exercises involving the site team in testing new equipment, and responding to simulated flooding scenarios. 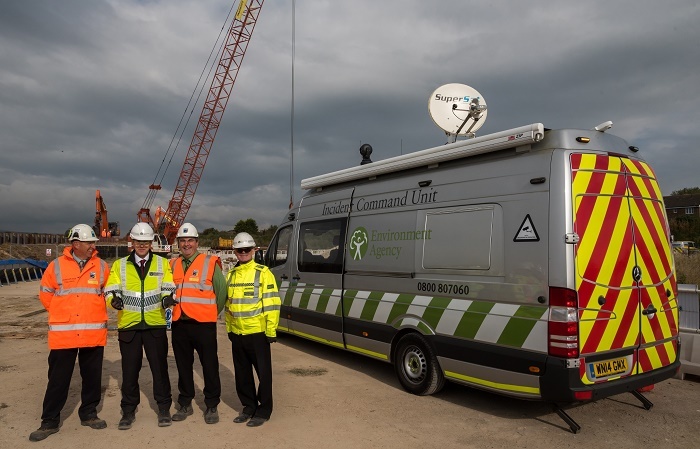 Speaking after the visit, Andrew Gilham, Progamme Delivery Manager for the Environment Agency, said: “Thanks to the TVO team for the help and proactive work they did to facilitate the delivery of the live element of Exercise Certus. “They exemplified the ‘yes if’ approach, providing solutions and pragmatic responses while ensuring health and safety remained paramount. Speaking on behalf of Team Van Oord, Tony Camilleri, Managing Director of Mackley, said: “We were delighted to host this important exercise and to welcome Sir James Bevan and his colleagues to the Shoreham site. The town of Shoreham-by-Sea is vulnerable to tidal flooding from the River Adur. The risk of flooding will increase over time as climate change leads to sea level rise. Working on behalf of the Environment Agency, Coast to Capital Local Enterprise Partnership, Adur District Council and West Sussex County Council, Team Van Oord has commenced work on a major scheme to reduce the risk of flooding to Shoreham and nearby Lancing. Under the Shoreham Adur Tidal Walls Scheme, improvements will be carried out along 7.2km of defences along the River Adur between Shoreham Old Fort and the A27. The scheme is separated into 10 reaches, or lengths of the estuarine bank. The design of the flood defences varies between the reaches as they have different characteristics and are subject to different pressures and potential flood impacts. The proposed defences include steel sheet piling, concrete walls, flood glass and earth embankments. Works also include raising a section of one of the main road accesses, and the creation of 1.32ha of intertidal salt marsh as compensatory habitat. The scheme has a high profile within the local community as areas of Shoreham were flooded in 2013. The design addresses the current flood risk, and future risk as sea levels rise, and will significantly improve protection from tidal flooding to properties and businesses on both banks of the River Adur. Work got underway in the second half of 2016, with completion expected in 2018.